If you are new to the game of golf, then there is a lot of terminology that can be confusing if you are not familiar with it. The first thing you need to learn is all of the golf club names and uses! I’ve got you covered with the all the names of golf clubs with pictures to help you get started. You might notice I haven’t listed any specific distances here. That’s because the distance any particular golfer hits a specific club can vary tremendously. Trying to reach a certain yardage number with a specific club can only hurt your progress as a beginner. You should be focusing on making solid contact, hitting the ball in the direction you intended, and with consistent distances so you know where it is going to land. As you improve, you can work on increasing distances, but you may find that your distances increase naturally as you work on those other three aspects. The driver is typically the largest and longest club you will have in your bag. For a buying guide on the Best Drivers For Beginners CLICK HERE or to see my guide on the current best drivers overall, CLICK HERE. It is the longest in terms of distance the ball is supposed to travel and also in terms of the length of the shaft of the club itself. You will typically use this club only off of the tee. Modern drivers work best when the ball is teed up at least an inch off the ground. 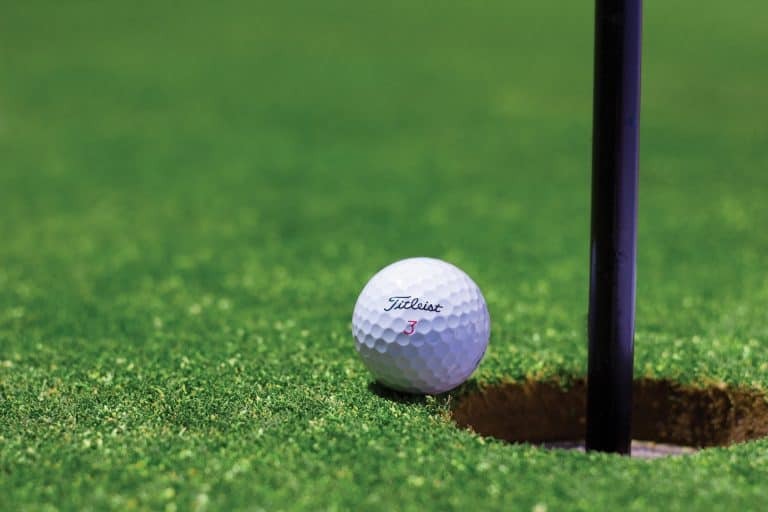 That is because the sweet spot of the club (the spot on the face of the club where the ball will go farthest when hit) is typically around an inch off the bottom of the club. As a beginner, you may think that this is the club to start with. After all, you practice at a “driving range” right? But trying to learn golf as a beginner by grabbing the driver first is like taking driving lessons in a Ferrari. You’ll get frustrated, develop bad habits, and maybe crash into a tree or two. You should start with the shorter clubs like wedges and short irons and then move to the driver. In fact, most beginners and high handicap players would benefit significantly by skipping the driver altogether and hitting a 3 wood off the tee. Fairway woods are clubs that are used for longer distance shots like the driver but designed with a smaller head so that you can hit them off the ground as well as off of the tee. They are called fairway woods because they are most often used for longer shots off the fairway. You can use them out of the rough too, but this can be a difficult shot depending on the severity of the rough and your skill level. Fairway woods tend to have a larger sweet spot than irons and travel farther than the longest irons. This is because of the size of the clubhead compared to an iron. A wood will typically have a larger clubhead than an iron. This additional mass causes the ball to travel farther and can compensate for miss hits more so than an iron. 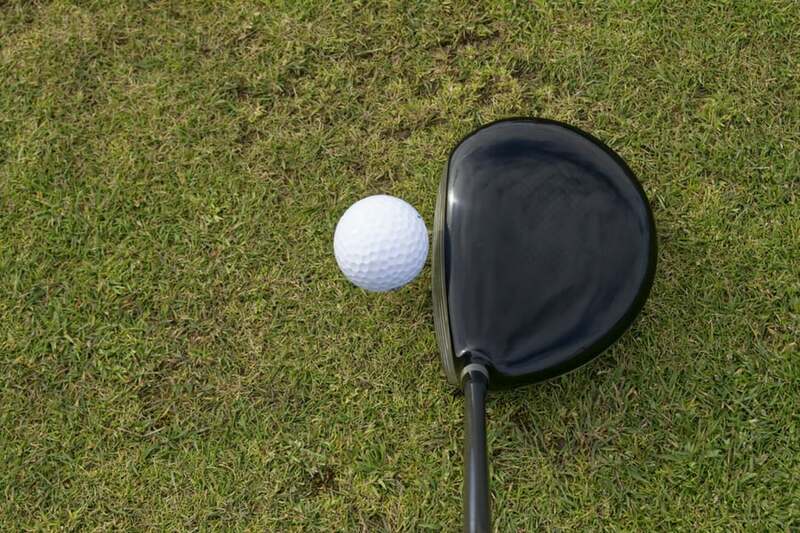 A fairway wood shaft will usually be longer than an iron and shorter than a driver. This can make the club more difficult for beginners to hit than the shorter irons, similar to a driver. This can be especially true when attempting to hit the ball off of the ground rather than a tee. Hybrids are a relatively new type of club in the world of golf compared to the traditional irons and woods. A hybrid is essentially a cross between an iron and a fairway wood. They typically have a larger clubhead than irons but smaller than a fairway wood. They also have shorter shafts than a fairway wood. 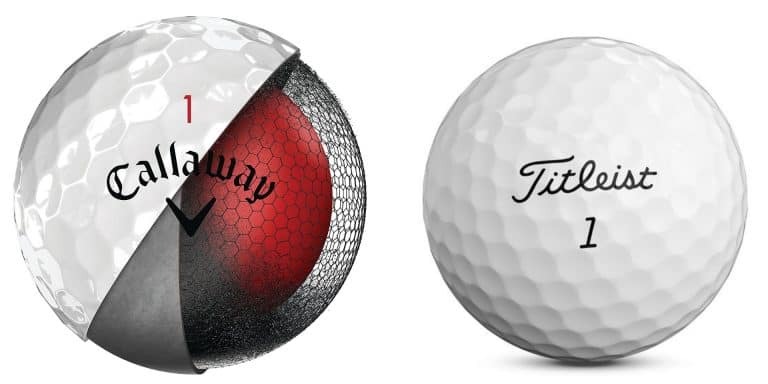 This combination tends to make them easier to hit than both fairway woods and longer irons. The larger clubhead helps get the ball up into the air faster which can be difficult for beginners to do with long irons. Long irons (a 3, 4, or 5 iron) requires a certain swing speed to hit the ball high enough and with enough spin to maximize distance. Hybrids require less swing speed to get the same distance and spin. For this reason, hybrids are a great option for beginners and should be your first choice compared to a 3, 4, or 5 iron. Many club companies have iron sets designed for beginners that consist of a combination of traditional irons for the shorter clubs and hybrids for the longer irons. Some hybrids are more like fairway woods (larger head and longer shaft) and some hybrids are more like irons (smaller clubhead and shorter shaft). Depending on your skill level and your individual swing characteristics you may lean towards one or the other. As you get better at making solid contact and increase your swing speed, you may find that some hybrids spin too much and go too high, costing you distance. When you get to that point, you should look into transitioning to more traditional irons, starting with your most lofted hybrid. Irons have been around for as long as golf and are the most numerous type of club in most players’ bags. Irons range significantly with respect to the loft of the club, the length of the shaft, and the distance you should expect to hit it. It is common to see irons broken down into three smaller categories, long irons, mid irons, and short irons. The term long irons usually refers to 2, 3, and 4 irons. These irons are that ones that many golfers, especially, beginners and higher handicappers, replace with hybrid clubs. They are used for longer shots and tend to roll a little more than mid and short irons. For this reason, it can be more difficult to be accurate with long irons. Long irons also tend to fly on a lower trajectory than mid and short irons (one of the main reasons many players replace them with hybrids). The benefit of this is that you can use these clubs to keep the ball low on purpose, whether that is to hit below a tree branch or minimize the effects of the wind. Mid irons usually refers to the 5, 6, and 7 irons. These are probably going to be among the most used clubs in your bag. They tend to cover the distances you’ll find yourself facing most often for an approach shot after an average drive as well as the tee shot on most par 3 holes. Of course this can vary depending on the course, but on average, mid irons will get a lot of use. For this reason, I would recommend spending a decent amount of time practicing with these clubs. An added benefit of practicing with these clubs is that it is only a small adjustment to get comfortable with either the long or short irons. Short irons usually refers to the 8 and 9 irons (the “pitching wedge” is sometimes referred to as a short iron and sometimes as a wedge). You may also hear these clubs referred to as “scoring irons.” That is because these clubs are designed for accuracy into the greens as well as generating spin on the ball to control how much it rolls out after hitting the green. 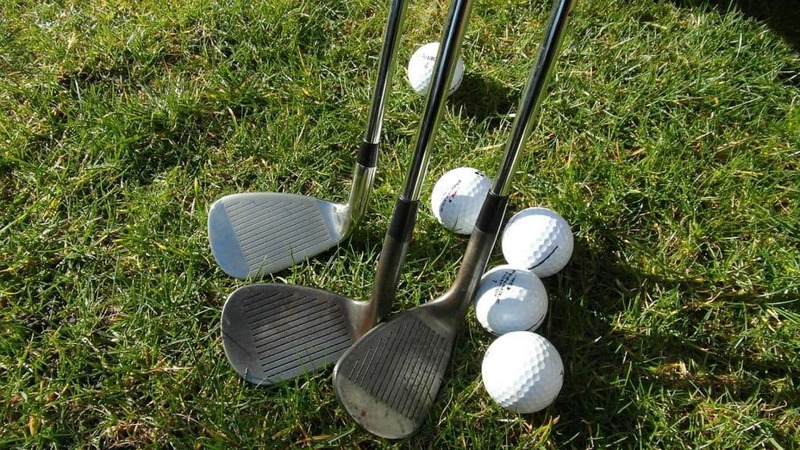 If you are just starting to learn the game, these are the clubs you should start with. There are a few reasons for that. First, they have shorter shafts which make them easier to learn with. New players tend to swing too hard or overswing with the longer clubs but not as much with the short irons. Second, once you are comfortable with these clubs, you can start enjoying the game on shorter courses. These courses are sometimes referred to as par 3 courses or “pitch and putt” courses. Getting off the range and on the course is a huge step and will help you learn faster and make the game a lot more fun. It is also a great way to get introduced to those short shots around the green such as pitching, chipping, and putting. Wedges are the most lofted clubs in the bag, typically have the shortest shafts, and tend to hit the ball the shortest distances. Wedges are also frequently used for “short game” shots around the green such as pitches and chips. These clubs are designed for accuracy and control. The only reason I don’t recommend starting with wedges is that some (such as a lob wedge or 60 degree wedge) can have a lot of loft and are more specialty clubs. That makes them a little harder to learn and less useful for a beginner to get started with. Check out my list of the best wedges here. 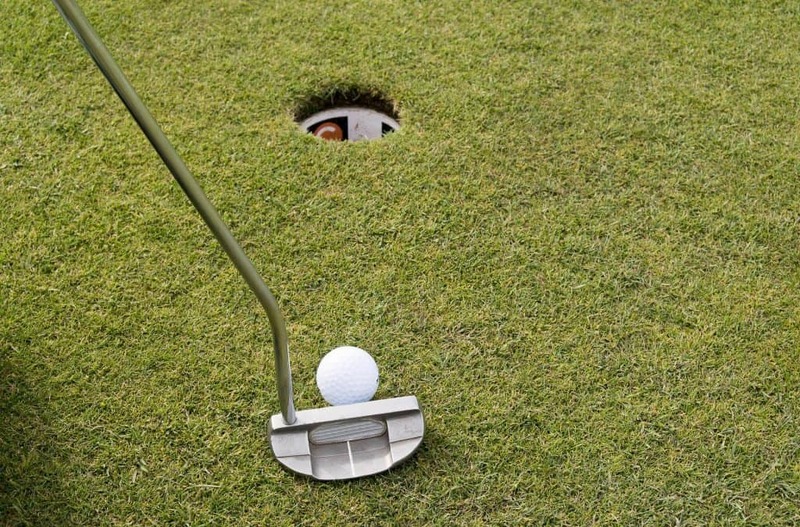 The putter is the club that is used to roll the ball along the putting green towards the hole. Putters can come in a huge variety of shapes, sizes, and styles. The two main types of putters you will see are blade putters and mallet putters. If you want to learn more about the difference between the two, you can read more about that here. Despite all these crazy designs, the putter is quite simple in its function. It is made to get the ball rolling smoothly and give the golfer good “feel” on the greens. Feel can mean a lot of different things to different players, but in general it refers to the player’s sense of how hard to hit the ball to get it rolling the correct distance. Unlike full swings where the loft of the club will change the distance you hit the ball, a putter has to cover a wide range of distances on the green based on how hard you hit the ball. Putter choice can rely on personal preference much more than any other club, so when choosing one, you probably want to try a variety of them. This certainly isn’t a complete guide to everything beginners need to know about the different types of golf clubs. So if you’re a beginner and you have a question, leave it in the comments below. I’ll do my best to answer it or find an expert that can answer it. Your question might even become a new post.